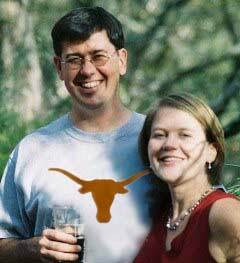 Here we go with another installment of beery adventures that took place when my Texas friends were in town a couple weeks ago. 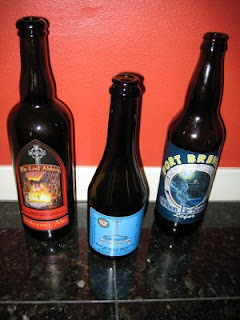 In addition to the Isabelle Proximus that we opened July 4th, Todd also brought two more Lost Abbey beers from Port Brewing -- Inferno Ale and Moonlit Sessions Lager -- and a bottle of Russian River Supplication. We had a poker game/beer-tasting the night of July 1st, and those three California beers were supplemented by some Oregon heavy-hitters I'd been saving up to spring on Lee and Todd. A lot of work went into Supplication -- a brown ale with four different wild yeasts and bacilli, aged on sour cherries 14 months in pinot noir barrels, then bottle-conditioned -- but sadly all that work is wasted on those of us who haven't caught the sour-beer bug. It reminds me of this anecdote from the liner notes of a CD of Ligeti's Cello Concerto: "A number of the critics present [at the premiere] expressed surprise at the evident disproportion between the enormous difficulty of the work and ... the acoustic result". That's about how I feel about Supplication and Isabelle Proximus -- all that effort for just sourness. But Supplication does have its fans: here's a fresh blog entry (with nice photos) from someone who gets it. The Lost Abbey beers on poker night were more to my liking. Inferno is in an abbey-style bottle with a champagne cork, but it didn't have that yeasty dubbel/tripel flavor; it seemed to me to be more in the Duvel family tree. The Moonlit Lager was a good poker-game beer; only 5% ABV but with a rich roasty flavor. It was fun to rotate in the big Oregon beers also. I was happier with the Pavlov's than when I opened my other bottle of it six months ago. Brett's Belgian went over really well, and of course Fred from the Wood and Abyss are slam dunks any time. But the real Oregon success story was Dave's poker game. He was the only native at the table, and he took so much money from the Texans that he decided that Texas Hold'em should be called Oregon Hold'em from now on. Thanks again to Todd and Andy for the California beers -- Lost Abbey and Russian River are hard for us to get here. And thanks to Brett for the awesome homebrew. I'm glad you were taking notes. I can't really remember which beer was which. I just remember that I did not care for the sour beer, but everything else ranged from good to great.